The main activity of the AAVSO Solar Section is the monitoring and recording of sunspots from which the American Relative Sunspot Numbers (RA) are computed. 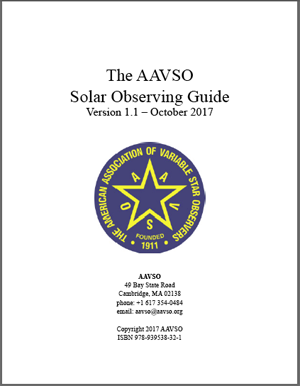 The AAVSO Solar Observing Guide explains exactly how this can be done in a safe and effective manner. Reading this Guide is essential for anyone interested in pursuing this fun, fascinating, and useful work. even just briefly, is potential loss of vision in the eye. Observing the sun, especially with a telescope, is a dangerous activity that demands strict adherence to safety protocols. The sun is unique among the objects that AAVSO observers pursue because it is so bright. The most important guideline for solar observing is observe safely. This cannot be stressed enough, and if you are uncertain about any of the equipment and safety recommendations described in this Guide, please request assistance before making any observations of the Sun with your equipment.